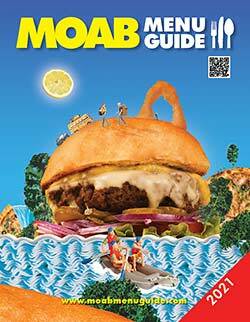 View the entire 69 page Moab Menu Guide. This pdf file is 25 MB and may take a few moments to download. Download individual menus for Moab's restaurants by clicking the restaurants' name or logo in the list below. Just like Moab Happenings, the Moab Menu Guide is a real paper guide. You can pick up a free copy at many businesses in town. If you are planning a visit to Moab and you would like copies of the Moab Menu Guide for your group, conference, convention, film crew, wedding party, family reunion, etc., we will supply your special event with copies of the Moab Menu Guide. Contact us at info@moabhappenings.com or (435) 259-8431. This menu guide is provided as a visitor service by the restaurants that are included. All pricing, menu selections and operating hours were submitted by the respective advertisers and were accurate at the time of publication. As the seasons change and market conditions vary, some information may change during the course of the year. It would be advisable to verify specific menu items or prices prior to making your dining plans. See a map of Moab with the locations of restaurants here. Click on a restaurant's Logo or Name to see their menu.